It was during the silent film era of the 1920s that Denmark made one of its largest contributions to the history of film and entertainment: the comedy team of Carl Schenstrøm and Harald Madsen. The actors’ stage names were Fyrtaarnet and Bivognen (meaning ‘lighthouse’ and ‘trailer’), but they were known by their fans in Germany and Austria as Pat und Patachon, in France as Doublepatee et Patachon, in the UK as Long and Short and at home in Denmark simply as Fy og Bi. The pair became the world’s first comedy duo, establishing a formula that comedians would follow for years to come. It was Fy and Bi who introduced the idea of the ‘tall and short’ pair: one playing the straight man and the other the joker. Their onscreen personas and the scenarios they played out would inspire such future comedy teams as Laurel and Hardy and Abbott and Costello. Both Schenstrøm (Fy) and Madsen (Bi) had some minor successes before joining forces, but it wasn’t until the film producer and Palladium film company founder Lau Lauritzen introduced the two in 1921 that their careers really took off. From that moment on, Fy and Bi were a team. The pair worked well together from the beginning as each played off the other’s strengths. Schenstrøm had some talent as an actor, but was not a physical performer, while Madsen’s circus background had given him the genius necessary for the physical stunts that the slapstick routines of the silent film era demanded. 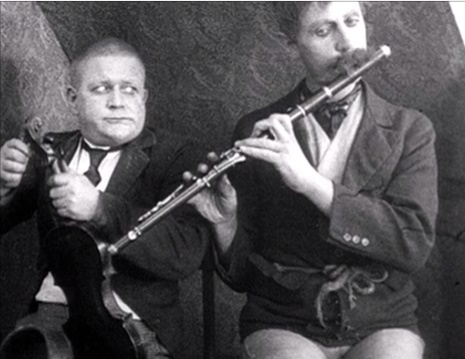 According to film historian Marguerite Engberg, Schenstrøm and Madsen “were able to play both alongside and against each other, which was something that comedies of the day had not yet produced”. Fy and Bi could, continued Engberg, “play comrades facing the ills of the world together, or they could turn against each other by teasing and mocking back and forth”. Fy and Bi films usually had simple plots that allowed for as much slapstick as possible, and though different predicaments might befall the characters, they always returned unchanged for the next film. The duo’s greatest international success was the classic film ‘Lykkehjulet’ (‘The Wheel of Fortune’). Directed by one of Denmark’s greatest film directors, Urban Gad, it set the international standard for comedies, and it is still referred to today. The story is a romance between Ethel, a poor young girl, and Erik, a starving artist. Kept in poverty by the caprices of an evil, greedy lawyer, Ethel discovers that she must recover the only existing copy of her father’s will, which is hidden in a cabinet inside the lawyer’s house. Ethel and Erik enlist Fy and Bi to recover the will and, after a series of thwarted attempts and plot twists, the comedy team manage to save the day. Gad’s genius for story and detail, combined with Schenstrøm and Madsen’s talents for comedy, made ‘Lykkehjulet’ a classic comparable to Buster Keaton’s ‘The General’ or Charlie Chaplin’s ‘The Kid’. Unfortunately, Fy and Bi did not always have directors as talented as Gad to work with. Unlike Chaplin, who sought to develop his screen character from film to film, Fy and Bi remained static in theirs. As Engberg points out, this was probably due to the fact that the stars neither directed nor wrote any of their own pictures. Whereas Gad had kept their humour contemporary to the tastes of the day, later directors made no attempt to shape the pair, and so Fy and Bi became passé. Their final film was shot in 1940. But back in their day, Schenstrøm and Madsen were ground-breakers – most probably due to the innocence portrayed in their films. Unlike the majority of Europe, Denmark did not participate in World War I, and while Germany, Austria, England and France struggled to recover, Denmark and Danish culture retained the innocence of the decades before the war. Unscathed by the horrors of the trenches and the nightmare of war, the comedy of Fy and Bi could make the world laugh without bitterness.